Gerardo Del Real: This is Gerardo Del Real for Outsider Club. 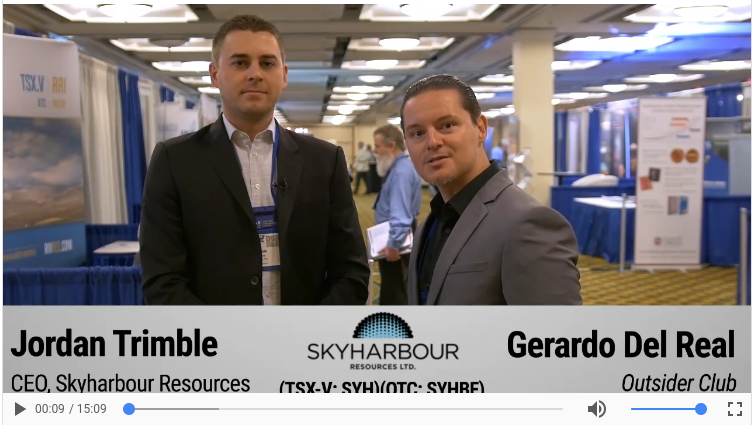 Joining me from the New Orleans Investors Conference CEO of Skyharbour resources, Mr. Jordan Trimble. Gerardo Del Real: Jordan, thank you for joining us. Gerardo Del Real: I'm a big proponent of a few things when I speculate or invest in a company. I'm a big fan of sharing structure. You've got to have long term committed shareholders that know about the discovery process and allows that to play out, and jurisdictions matter. I'm seeing a lot of that in the market lately, where companies have a great asset in the wrong place. Jordan Trimble: Absolutely. That's a big part of the uranium space too, right? What I look for and what I've been doing with Skyharbour, my team and I, we want to focus in a jurisdiction where we know we can go out there, we can make a discovery that's going to add value, that's going to create shareholder wealth, and the Athabasca Basin really is that jurisdiction in the uranium sector. You don't really have anything else out there like it. It's really a geological anomaly. You have these high grade deposits even in a declining commodity price environment as we've been in for uranium, it's a contrarian pick. You can still see these significant enormous returns for investors. We've seen that with NexGen. We've seen that with Fission. We've seen that with Alpha, and they ended up selling to Fission. We saw that with Hathor, right? That was significant in a bear market. Jurisdiction is key. Not only is it a complete geological anomaly, highest grade uranium deposits in the world, we're talking in a magnitude of ten to twenty times that of other jurisdictions, but it's also safe. It's a great place to work. Saskatchewan is one of the best places in the world. I've worked on projects and with companies with projects in all the provinces and a number of the states down here in the US, and Saskatchewan is the best that I've worked in as far as geopolitics and you look at the First Nations there. The largest employer of the First Nations in Saskatchewan is Cameco – Cameco and AREVA.